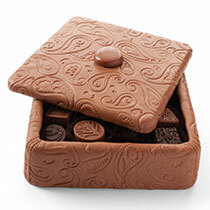 The Paisley Leather Box is handmade of creamy milk chocolate with an elegant paisley pattern with stitching in the corners and adorned with a chocolate button. 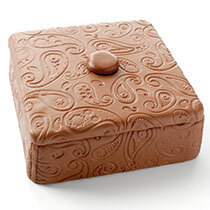 The Flower Power Box is handmade with rich dark chocolate and decorated by hand with white and milk chocolate flowers and an adorable dark chocolate ribbon. 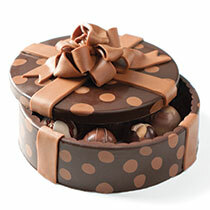 The Polka Dot Box is an elegant box handmade of rich, dark chocolate with milk chocolate accents such as a gift ribbon with a bow. 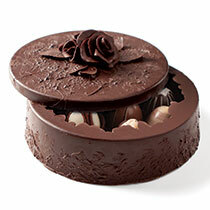 The Black Rose Box is handmade of rich, dark chocolate with very delicate dark chocolate accents adorned by a rose and leaves. 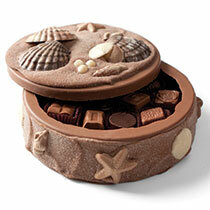 The Seashell Box is a fun milk chocolate box covered with cinnamon and sugar with milk, dark and white chocolate accents and so many types of chocolate sea creatures. 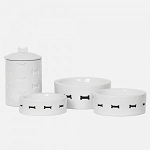 The artisan Art Boxes are handmade and therefore no two will be identical. What a fun gift! Approximately 6 1/2" long x 6 1/2" wide x 2 1/2" high. 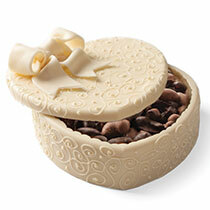 This box makes the perfect gift empty or when you choose a "filled" box, filled with your choice of the popular Classic Collection, decadent Truffle Collection or rich Chocolate Deluxe Nuts. 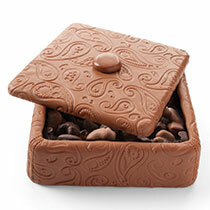 The Empty Chocolate Art Box - add your personal touch by filling it with your own home confectioned and baked goodies. The Classic Collection consists of timeless favorites such as luscious caramels, all-natural fruit creams bursting with wonderfully intense flavors and many other unusual and traditional varieties. The Truffle Collection includes Almond, Black & White, Caramel, Coconut, Dark Chocolate, Deluxe Nut, Key Lime Pecan, Macadamia Hazelnut, Milk Chocolate, Mocha, Peanut Butter and Raspberry. 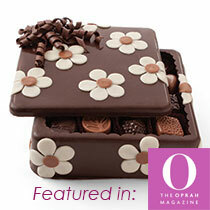 Each silky, rich truffle is like a petite, luxurious chocolate dessert. 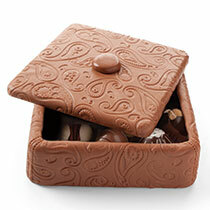 The Deluxe Nuts box is filled with a mixture of Milk and Dark Deluxe Nuts.